Ultimate Mahjong allows you to quickly switch between 2D and 3D. It's up to you which you use, they both look great. The layout editor which comes integrated into the game couldn't be easier or more intuitive to use, create new tile layouts to challenge you or your friends. See who is the best Mahjong player by getting your score on the top-10 score board. You can even upload your scores to our website and compete against the rest of the world! Put your own pictures onto Mahjong tiles and make a custom tile image set. Images can be any size or format for total ease of use. Watch tranquil butterflies flutter around the screen and fade away, in 3D mode set up colored lights or choose from a list of lighting themes. Ultimate Mahjong is full of visual effects which make it even more fun. 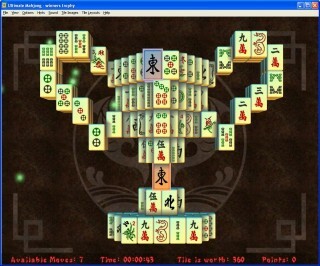 Ultimate Mahjong comes with a selection of over 30 soothing oriental music tracks created specially for the game. If you get stuck or need help finding a move then there is a selection of hints available to you, everything from peeking below a layer to matching a chosen tile. If you make a bad move and need to go back then there is an undo feature, which can undo or redo an unlimited number of moves or shuffles. There are so many other features, please download a free demo and see them all!